Child custody disputes can take many different forms, but no matter what the parents are arguing about, every case has the potential to elicit intense emotions from all of the parties involved. And when one of the parents is suffering from some form of mental instability, the case can be even more difficult for the family members to endure. Fortunately for parents in San Diego, one of the goals of the local family court system is to assist families in the settlement of domestic controversies that involve the welfare of children. An experienced family law attorney, with extensive knowledge of the local court system, can help you to navigate the process while seeking to preserve and protect your rights every step of the way. A recent California case addressed the jurisdictional reach of the juvenile court where one parent is deemed unable to care for the children, while the other is, in fact, capable of doing so. Here, the parents had two children, one born in 2008 and the other in 2010. According to the facts of the case, on numerous occasions, the mother exhibited signs of serious mental illness, including hallucinatory and other delusional behavior. The Los Angeles County Department of Children and Family Services (the “DCFS”) got involved and filed a petition under Section 300(b) of the State’s Welfare and Institutions Code, alleging that the mother had mental and emotional problems. At this point in time, the juvenile court ordered the minors released to the parents under the following conditions: that the mother is not left alone with the minors, and that she take her prescribed medication and continue therapy treatment. The father was required to participate in individual counseling and family preservation programs. Later, the father asked the juvenile court to terminate the dependency case with a family law order granting him sole custody of the children. The juvenile court declared that both minors were dependents of the court and ordered them removed from the mother. The court granted the father sole legal and physical custody – and that order was filed in family court. The mother appealed the court order, arguing that there was insufficient evidence to support the juvenile court’s jurisdictional order. The California court of appeal held that the matter belonged in family court. Once the juvenile court filed the custody order in family court, the matter no longer came under the juvenile court’s jurisdiction, and thus, there was no reason for that court’s adjudication and dispositional orders. In other words, once the juvenile court determined that the children would not be at risk in the father’s custody, the matter belonged in family court. The court found that the juvenile court should have dismissed the petition, and stayed the order until the father was able to obtain a family court custody order. The court remanded the matter to family court for a hearing on custody and visitation. This case clearly demonstrates the potential complexity of child custody disputes within the local court system. Parents confronting child custody and visitation issues are encouraged to contact an experienced family law attorney. If you are a parent with questions about child custody matters, contact Doppelt and Forney, APLC . 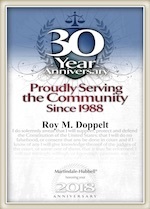 Mr. Doppelt is an experienced family law attorney and has been representing parents involved in child custody disputes for more than 20 years. Doppelt and Forney, APLC serves clients throughout Southern California, including San Diego, Encinitas, La Jolla, and Chula Vista. For a free consultation, contact Doppelt and Forney, APLC through our website, or give us a call toll-free at (800) ROY IS IT (769-4748).